A sample recipe from Cafe Sassone Cookbook. Two recipes for the price of one. I worked on these “Twist” recipes for Moore Groceries, the cookbook I did with Martha Whitaker to benefit the Old Court House Museum. We didn’t have room to use them, so here they are for posterity. 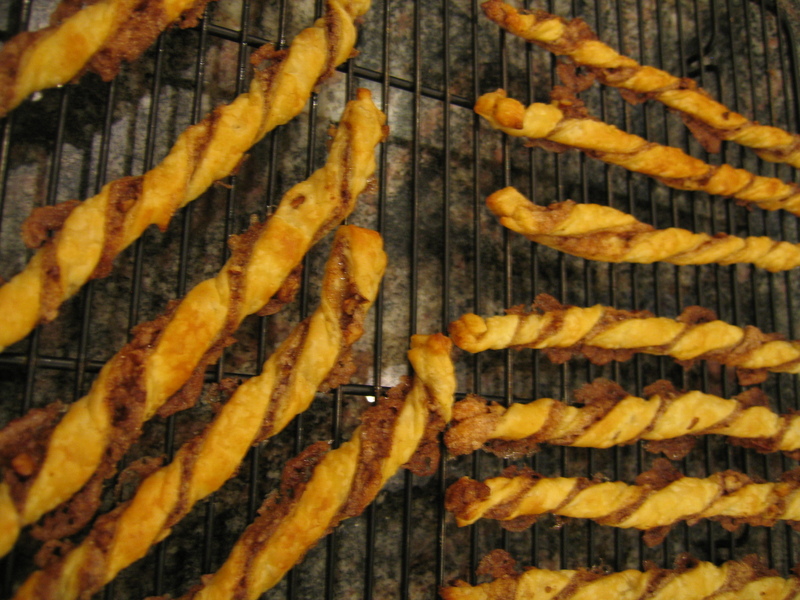 The Cinnamon Twists are great for a breakfast buffet, the Parmesan ones for a cocktail party or picnic. Preheat oven to 400°. Combine sugar, pecans, and cinnamon in a small bowl. Line 2 baking sheets with parchment. Unfold puff pastry sheet on a large cutting board. Brush with beaten egg and spread pecan mixture evenly over the sheet. Using a pizza wheel, cut the sheet into ½-inch wide strips. Twist each strip and place on parchment, not touching. Bake 12 to 16 minutes, or until golden. Let cool on racks. Preheat oven to 400°. Combine Parmesan, paprika, and cayenne in a small bowl. Line 2 baking sheets with parchment. Unfold puff pastry sheet on a large cutting board. Brush with beaten egg and spread cheese mixture evenly over the sheet. Using a pizza wheel, cut the sheet into ½ inch wide strips. 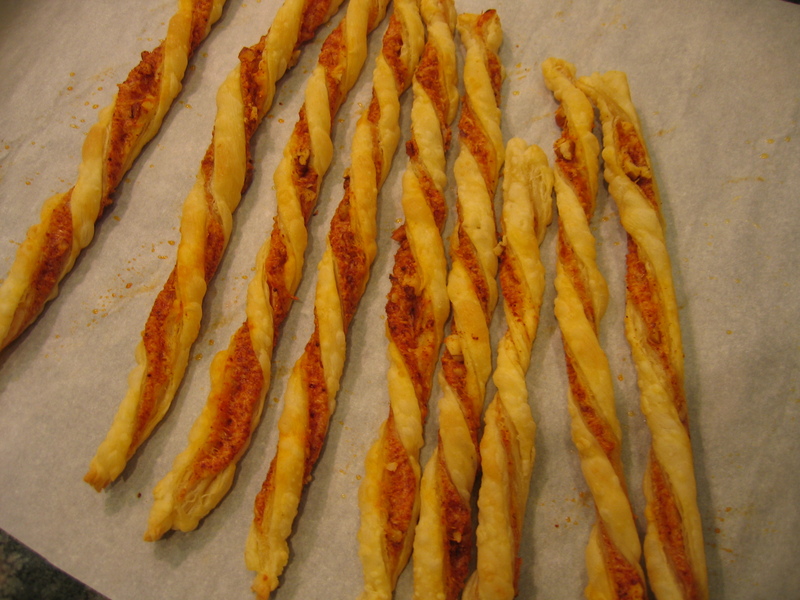 Twist each strip and place on parchment, not touching. Bake 12 to 16 minutes, or until golden. Let cool on racks. This entry was posted on November 3, 2009 at 3:31 pm and is filed under Breads & Sandwiches, Recipes. You can follow any responses to this entry through the RSS 2.0 feed. You can leave a response, or trackback from your own site.